The Galaxy Note 4 with Lollipop? 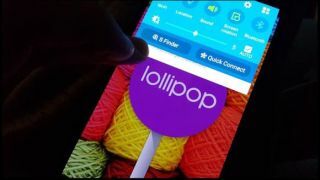 Android 5.0 Lollipop has been rolling out here and there, on Nexus devices like the Nexus 6, the LG G3 and others - but there's been little word of Lollipop for the Samsung Galaxy Note 4. These new pictures change that, and provide a glimpse at what the Note 4's UI will look like with the new Android update on board. We've also caught a glimpse of the Note 3's Lollipop update, and it's worth noting that it looks pretty similar to what we're seeing in these two images. It's not much, but it does indicate that while the Samsung Galaxy S5 might get its Lollipop update this month, the Note 4 probably won't be far behind. And now you're wondering: when can I get Android 5.0 Lollipop?